This new disc from recorder player Jill Kemp, Aztec Dances on the Prima Facie label, showcases new British music for recorder and piano. Accompanied by Aleksander Szram, Kemp performs Edward Gregson's Aztec Dances, Gregory Rose's Garden of the Gods, David Bedford's Kemptown Races, George King's Dance Suite and Daryl Runswick's Cycles. 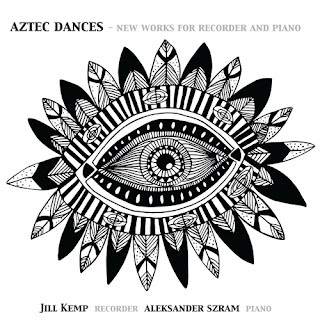 The combination of recorder and piano is still a relatively unusual one and the repertoire on this disc, all but one piece written for Jill Kemp, represents Kemp's admirable desire to continue the expansion of the recorder repertoire which happened in the 20th century with figures like Carl Dolmetsch. (See my recent interview with Jill Kemp for more background on the music and the disc). Edward Gregson's Aztec Dances was written 2010 and commissioned by the recorder player Chris Orton. The work is in four movements, 'Ritual/Pastorale', 'Fertility Dance', 'Ghost Song' and 'Sacrificial Dance' and the original inspiration for the piece came from a visit by Gregson to an exhibition at the British Museum about Aztec civilisation, particularly a section on music and dance in Aztec. The result is a sequence of fascinating dances which weave more esoteric Aztec type sounds into Gregson's own voice, utilising the recorder's ability to sound primitive to great effect. The writing for recorder includes a number of extended effects, and in 'Ghost Dances' the recorder is played into the piano to utilise the resonance of the piano strings. Gregory Rose's Garden of the Gods is also an historically inspired suite of dances, though in this case inspired by the ruins of the Odeion or concert hall of Agrippa which was constructed in 15 BC in Athens. The work is a sequence of seven movements 'Introduction', 'Greek Dance', 'Love Song', 'Giants and Tritons', 'Altar of the Twelve Gods', 'The Panathenaic Way' and 'Celebration'. Rose's writing feature some lovely textures, and that for the opening 'Introduction' is particularly magical, Rose has clearly taken particular care with the relative recorder / piano balance, though that does not preclude other movements developing moments of intense drama. The final 'Celebration' ends on a perkily celebratory note with not a little virtuosity. David Bedford's Kemptown Races (Variations on a theme by Stephen Foster) was evidently inspired by the brass band tradition of a theme and variations showcasing a particular soloist. The title of the piece involves a pun on Jill Kemp's name (Foster's original being Camptown Races). The result is delightful, as well as being quite a virtuoso feat including, at one point Kemp plays two recorders at the same time. George King's Dance Suite brings together dance movements old and new in a sequence of four movements 'Dub', 'Jig', 'Minuet' and 'Bebop'. King writes in a complex, jazz-influenced style with some wonderfully spiky moments but all suspended within the different dance rhythms, so that 'Dub' has an edgy recorder part over a delightfully edgy stride bass. 'Minuet' is the quieter and more lyrical of the movements, but still spiky, and the fast jazzy rhythms of 'Bebop' create a bravura finish. Daryl Runswick's Cycles uses a recorder and a piano prepared by laying a small-gauge chain across the bass strings, and the higher strings are sometimes played with a percussion beater or plucked with fingernails. The recorder and piano parts are not coordinated, the players start at predetermined places but from then on the two unfold in parallel paths, providing accidental harmony. Runswick's writing deliberately allows space for improvisation, giving the players great interpretative leeway. The title refers to the fact that the music in both instruments cycles round six times, but in the piano part, music is subtracted each time so that the cycles get shorter whilst in the recorder the music is expanded so the cycles get longer. The result is starkly striking and austere, but creating some very haunting moments and, of course, the tantalising awareness that next time you hear it, it will be different!